Recorded name Wesley assigned as an official name, with a defined extent. Published in the New Zealand Gazette on 13 March 2019. A suburb of Auckland, approximately 6km west-southwest of the CBD. 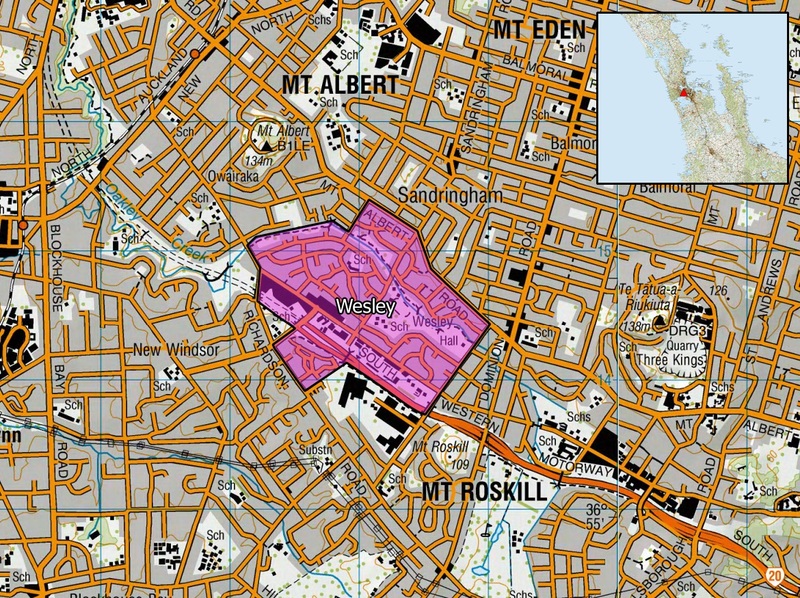 Bounded by New Windsor to the west, Mount Roskill to the south, and Sandringham to the north. Centred on NZTopo50-BA31 540144. The extent is depicted below, and at https://www.linz.govt.nz/map-wesley. NZGB Report - Proposal for Wesley (suburb) (PDF 500KB) - The NZGB considered this proposal for Wesley (suburb) at its meeting on 16 October 2017, and deferred it for further information. NZGB Report – Deferred proposal for Wesley (suburb) (PDF 429KB) - The NZGB reconsidered and accepted the proposal at its meeting on 27 September 2018. The proposal is notified for three months so the public can make submissions supporting or objecting to it. See the File Attachments section below for the media advisory on 5 November 2018. Consultation occurred between 5 November 2018 and 5 February 2019. Submissions are now closed for this proposal. No geographic name proposals are currently open for consultation.